Violence against women is one of the greatest development, security, and humanitarian challenges facing Papua New Guinea (PNG). Despite increased discussion from national MPs, including the Prime Minister, Peter O’Neill, about the need for solutions, there remain troubling gaps between promises and progress. The Family Protection Act, passed in 2013, is yet to be enforced. The lack of political will to make responses to family and sexual violence a policy and budget priority disproportionately affects Papua New Guinean women. Part of the explanation for why women’s security is not more of a priority is the lack of women in elected leadership positions in Papua New Guinea – which is a problem in itself. This week, international NGO Medicin San Frontiers (MSF) published data collected over two years from the Family Support Clinics that MSF manages in the capital, Port Moresby, and in Tari, in the Central Highlands. This data confirms the endemic nature of violence against women in Papua New Guinea and the alarming and continuing failure to provide female survivors with support, safety or access to justice. 94 per cent of survivors of violence who come to MSF centres are women. The shortage of safe-housing and lack of access to legal support means many of these women have no alternative but to return home, to the place where the abuse occurred, to face further and often worse violence. Organisations that provide support for women who have experienced violence are struggling to cope with the demand. In Lae, local NGO Femili PNG Case Management Centre, funded predominately through Australian aid , have supported more than 370 women since opening 18 months ago. This support includes linking women to welfare officers, working with police and courts to obtain interim protection orders against assailants, and, where possible, finding emergency accommodation. IWDA partner organisations Voice for Change (Jiwaka), Nazareth Centre for Rehabilitation (Autonomous Region of Bougainville) and Eastern Highlands Family Voice (Goroka) all report similar challenges in their work. A key constraint in all areas is PNG Government buy-in and resourcing. Even in areas such as Bougainville where the government is broadly supportive of the safe housing, counselling and primary prevention initiatives offered by Nazareth Centre, the police Family and Sexual Violence Unit and the Public Prosecutors office remain under-resourced, and therefore unable to respond quickly and adequately to complaints. The alarming levels of violence against women in Papua New Guinea are receiving increased attention in PNG’s media. This is important. However, the response of the Government and justice system in no sense matches the needs, priorities and security of women or the significance of the problem – in terms of its implications for human rights, public policy and PNG’s economy. Addressing the lack of women in elected leadership positions in Papua New Guinea is key to change. Currently only 3 of the 109 seats in the PNG National Parliament are occupied by women. Of the 325 Local Level Government Presidents, only 3 are women. These are among the lowest rates of representation of women anywhere in the world. 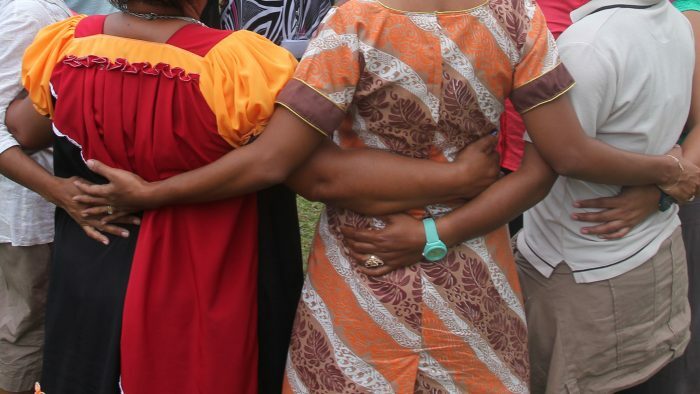 Tackling the root causes of violence against women in Papua New Guinea requires addressing the exclusion of women from decision making at all levels. Greater numbers of women in governments have been linked to lower levels of corruption and strengthened democratic processes. Women have historically and consistently played important roles in peace-building processes worldwide. Research also shows that where there is increased political representation of women, it is more likely that progressive policy in areas such as health, education and law and justice will be passed and resources provided for their implementation, from paid parental leave to addressing family and sexual violence. Continuing international support to address violence against women remains critical. So too, is international pressure for increased PNG Government attention to the safety of its female citizens. Promises must be backed up with action. In the lead up to International Women’s Day, IWDA commends the continued focus on ending violence against women in the Australian Government’s new Gender Equality and Women’s Empowerment Strategy. This includes a commitment to support strong justice sector responses to violence against women internationally and to increase women’s access to support services. This commitment was emphasised by Australia and PNG in joint ministerial meetings held this week. It is essential that this involves support for the work of women’s rights organisations and networks throughout Papua New Guinea. These organisations are working on the front line to ensure the safety and dignity of women who face violence in their everyday lives. They are also pushing to get more women into seats of power to bring about effective policy and crucial resourcing of solutions. This work must be supported and resourced if increased rhetoric around violence against women is to lead to real change in the lives of Papua New Guinean women.